VIDEO at fire scene at 3010 Mannheim Road in former hotel building overnight. 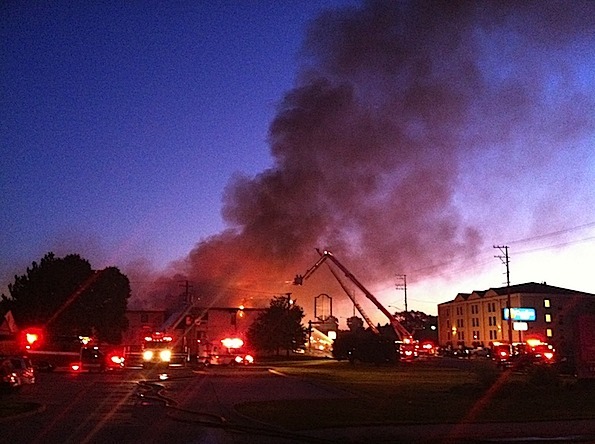 A fire last Thursday, August 11, 2011 at the 3010 Mannheim Road has been declared arson after an accelerant sniffing K-9 from the Illinois State Fire Marshal’s Office was brought to the scene of the former Super 8 Hotel. The K-9 unit indicated ignitable liquid was found in the front lobby, where the fire was reported about 1:50 a.m.
Franklin Park firefighters responded just before 2:00 a.m. Thursday, August 11, 2011 to a fire at the former Super 8 hotel. The fire alarm was quickly elevated to a second level box alarm by about 2:15 a.m. The fire alarm was then elevated to a third level box alarm at about 3:00 a.m. Firefighters used six aerial trucks to attack the fire, which was slowly destroying the roof. Even with six aerial attacks, parts of the roof that were not deluged would flare up. Fire command decided to let a major portion of the roof burn. At 6:00 a.m. the fire was still burning parts of the roof, and heavy black smoke was thicker or more noticeable after sunrise. An estimated 100 firefighters from about 17 fire departments responded to fight the fire, including firefighters from Bellwood, Bensenville, Chicago, Elmhurst, Elmwood Park, Maywood, Melrose Park, Northlake, Norwood Park, River Grove, Rosemont, Schiller Park, Stone Park, Westchester and others. Fire and smoke still heavy at 6:00 a.m. Thursday morning. Mannheim Road was closed from Irving Park Road to Grand Avenue as fireground operations and hose lines covered Mannheim Road in front of the former hotel building. Photo of the fire scene at 3010 Mannheim Road at about 6:00 a.m. Thursday after ongoing fire operations of at least four hours, which included the use of six aerial trucks.